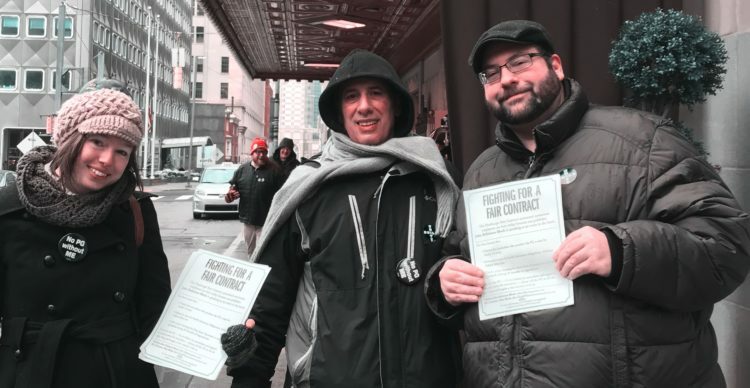 In December, Post-Gazette guild members protested outside where John Block spoke. Photo by Andrew Conte. Post-Gazette publisher John Robinson Block’s newsroom tirade Saturday night included him stumbling through the newsroom as he yelled, forcibly holding onto his young daughter as she cried uncontrollably and threatening to “burn the place down,” according to eyewitness accounts that the newspaper guild released Wednesday. The guild has since filed a National Labor Relations Board complaint against the Post-Gazette and has shared the following information. The Guild bulletin board sign at the center of Saturday’s uproar at the Post-Gazette. 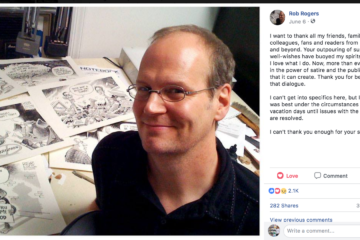 The publisher also shouted about how he had fired former editors David Shribman, who stepped down in December, and John Craig, who left the paper in 2003 and who died in 2010, according to the employee statements. Shribman declined to comment for this article. 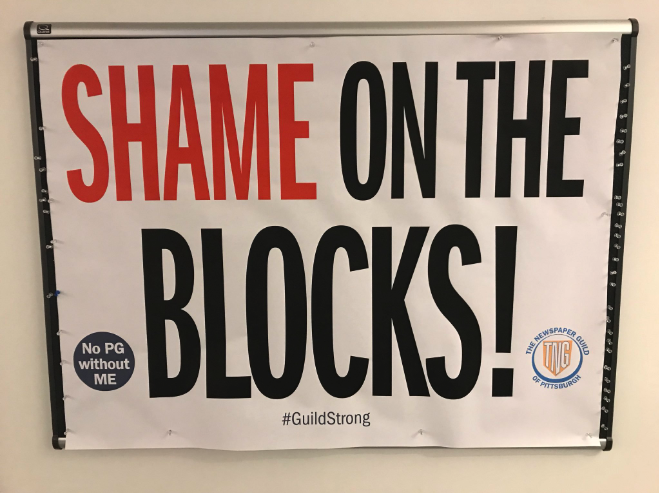 Block pulled on his daughter to force her to stand in front of a guild bulletin board in the newsroom that says, “Shame on the Blocks!,” employees said. The company and union are involved in contract negotiations that have gone on since the current contract expired at the end of March 2017. “You’re a Block don’t you forget it. You’re a Block, you’re not one of them,” Block said to his daughter, according to one employee’s statement. The Newspaper Guild of Pittsburgh said it took the unusual step of releasing the four employee statements about the incident after Allan Block, John’s twin brother and the chairman Block Communications Inc., issued a statement to me about the incident for NEXTpittsburgh. Guild president Mike Fuoco said in a statement released Wednesday that “nothing was misconstrued,” and that the union wants to release the statements to paint a clearer picture of what employees say happened. Block was with his daughter, whom NEXTpittsburgh is not naming because she is a minor. A Post-Gazette spokeswoman could not be immediately reached for comment. “On the evening of Saturday, Feb. 8, 2019, John Robinson Block, the publisher of the Pittsburgh Post-Gazette, called into the newsroom (via the phone specially designated for his incoming calls) around 9:50 p.m.
“The manager on duty that evening, Tim McDonough, answered the phone, spoke to Mr. Block, then hung up and went downstairs to let Mr. Block and his daughter, Xxxx, into the building through the front door and up to the 3rd floor. The two entered the newsroom around 10 p.m.
“As Mr. Block stepped off the elevator and proceeded to walk briskly — in a slightly stumbling, awkward manner — through the newsroom toward the ‘web hub’ area, he was immediately yelling about various topics, pointing and waving his finger repeatedly up in the air and swinging his arms. “He shouted that he wanted a picture of himself and his daughter taken in front of the Guild sign and demanded it run on the ‘front page of tomorrow’s paper.’ He fervently demanded the photos be taken NOW, right away and forcefully grabbed his daughter’s forearm, pulling her into the picture as she tried her best to pull away from him. She was crying, shaking and pleading with her father that she did NOT want to be in ANY photograph. “In his heightened agitated state, Mr. Block continued to walk back and forth in front of the Guild bulletin board and continued with his belligerent behavior. 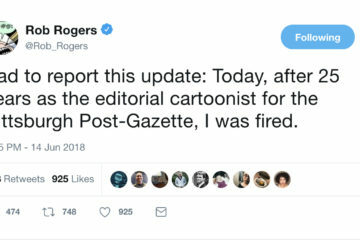 He did not and would not calm down: He repeatedly shouted out rude comments about various current and former managers, mocking them (saying some had ‘gone to the dark side’), the newsroom staff (what he called ‘the working class’), and his ex-wife, and bemoaned what he called a loss of millions of dollars on the part of the company.